Group consists of 30 convex squares, each approximately 29" x 30" x 4". The long center wall holds a group of 27. The north-end short-wall displays 2 squares and the south-end short-wall holds 1. The center group dimensions are: 55" x 836" x 4" which is 70 linear feet of continuous fiberglass. 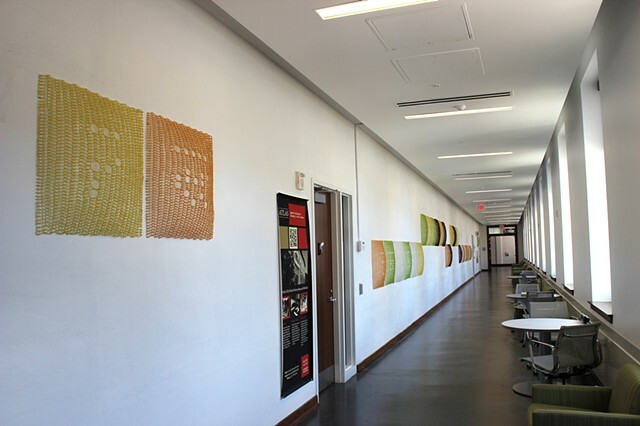 Lifesaver Movement in e is based on the beginning sequence of the infinite number e. It expresses each digit in binary code via the crochet tradition of filet charts. Filet charting is a traditional crochet format based on patterns created on a grid, where squares are either filled or left open to create an image. All computer language is based in binary code, a code of either 0 or 1 for a computer to toggle between. The code in a computer language is based in strings. Each binary string has eight binary bits that look like a bunch of 0s and 1s in a certain pattern unique for each letter of the alphabet. Combining these two on/off systems: 0 = off = open square; 1 = on = filled square. Using a free online text to binary translator, I translated digits in text (the words: zero, one, two, three, four, five, six, seven, eight, nine) to binary strings. The pattern within each square spells out the first 30 digits of e. The sequence continues to break the line of 30 into groups, floating or dropped. This short sequence is 266249, so you see 2 squares up; 6 squares down; 6 squares up; and so on. I continue to use the sequence to drop placement of color. White was color #1; sequence following 249 in e is 7757; count 7 spaces, white; count 7 spaces, red (color #2); keep running the sequence left to right until all blocks have color.